What is the difference between desert and desertification ? What is a desert ? A desert is a landscape form or region that receives very little precipitation. Deserts can be defined as areas that receive an average annual precipitation of less than 250 mm, or as areas in which more water is lost than falls as precipitation. World desert's map. Distribution of non-polar arid land. Source: USGS. The warm tropics form a belt around the equator where the tropical heat generates rising, unstable air. As it climbs, the air condenses the moisture evaporated from the warm tropical seas and forests, and produces the heavy downpours that characterize the wet tropics. As it moves away from the equator at high altitudes, the air cools again and eventually starts descending towards the midlatitudes, some 3000 km away from the equator both north and south. The air masses heat in their descent and, having lost their moisture during their tropical ascent, they become extremely dry. Most of the water in the atmosphere is ultimately derived from evaporation from the seas. The land closer to the sea often receives a larger share of this ocean derived water and, as air moves inland, it gets depleted of moisture and precipitation drops. Regions lying deep within a continent may become deserts simply because air currents reaching them have already traversed vast land distances and lost most of the moisture they originally carried. In the coasts neighbouring oceanic upwellings, typical coastal deserts tend to develop, forming some of the driest ecosystems on Earth. The upwelling of deep cold seawater, driven by ocean coastal currents, induce very dry inland conditions. 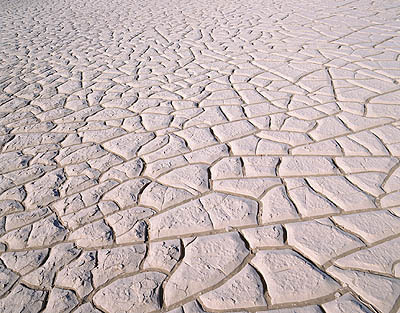 This type of desert can be seen on the western seaboard sections of the African and American continents. Deserts occur on the leeward sides of mountain ranges that are deprived of ocean generated moisture. The Sahara is the world's largest hot desert and the world's second largest desert after Antarctica. 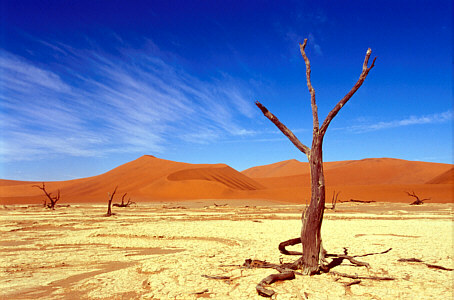 The Namib Desert (Namibia) is considered one of the oldest deserts in the world after the Atacama Desert (Chile). The Namib Desert. Photo: Julien Fauqueur. Desertification is the degradation of drylands in terms of their productivity. This global problem results from human activities and climatic variations. Dryland areas cover 40% of the world's land surface and are the most at risk of turning into deserts. Current desertification is taking place worldwide much faster than historically, and usually arises from the demands of increased populations that settle on the land in order to grow crops and graze animals. What can space technologies do about it ? Satellites images can highlight soil deterioration, erosion and loss of natural vegetation, and therefore help preventing dryland desertification.